Extracting the nicotine from cigarettes is possible to do at home with a few household objects. Different methods will result in different end substances; the easiest at-home method will leave you with a jelly-like substance that can be diluted with a few drops of water to make working with it easier. Nicotine is extremely dangerous in its pure form, so be sure to use extra caution using this or any method. 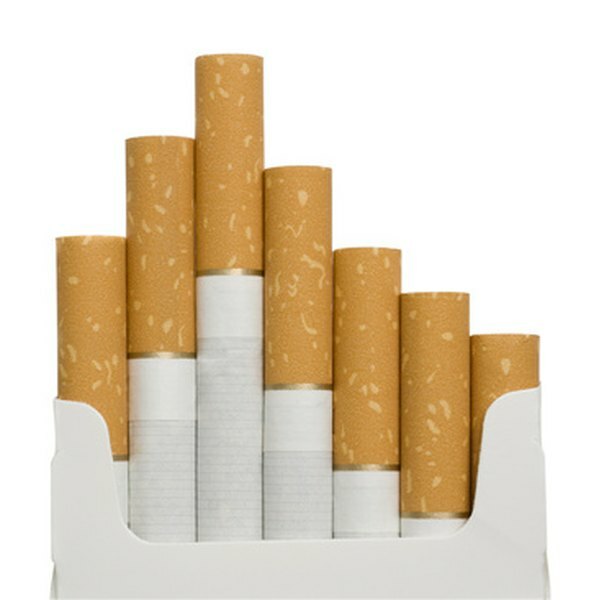 Cut up the cigarettes with the scissors to make the tobacco more readily accessible. Put the pieces in the glass jar and pour boiling distilled water over it. Close lid and leave to steep overnight (or at least a few hours). Wearing gloves, pour contents of jar through a coffee filter into saucepan to separate liquid from remaining tobacco. Wrap filter around solid remnants and squeeze to extract all liquid possible. Boil liquid slowly until liquid evaporates. You will have a sticky syrup left; while this will still have some additives in it from the cigarette, it is close to pure nicotine. Alternatively, you could not slow boil at all, simply allow the liquid to evaporate on its own. This will result in purer nicotine. This is an at-home simple method. To obtain truly pure nicotine, chemicals and various solvents can be used, such as hydrochloride or citrate. Experimentation seems to be the best way to decide what works best for you to obtain the result you need. Some who have tried the boiling method, indicate that boiling water is unnecessary and instead suggest putting the cut cigarettes into empty tea bags and simply steeping to obtain the nicotine. This would eliminate the need for coffee filters. Nicotine is an extremely dangerous poison that should not be ingested in its pure form, even in the smallest quantity. Keep your work area well-ventilated, either with a window open or fan running at all times. Be careful not to directly inhale.